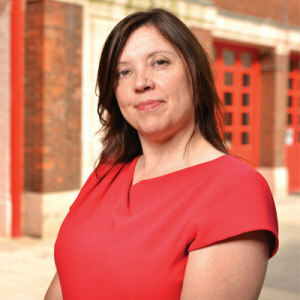 This determination is typical of de Souza who, at 46, is one of the younger chief executives of a multi-academy trust. She’s also one of the most controversial. As principal of two “turnaround” schools she became renowned for sending staff to drag students out of bed and introducing uniforms designed by Savile Row tailors. Despite her unorthodox ways, both schools improved their results. Since 2012 she has been CEO of Inspiration Trust, a Norfolk-based academy chain overseeing eight schools and a teacher-training centre. Inspiration’s four trustees, besides de Souza, are wealthy businessmen. One is Theodore Agnew, a non-executive director at the Department for Education, and long-time Conservative donor. Referred to by de Souza simply as “Theo”, Agnew has clearly been crucial in the trust’s development, providing significant financial and moral support. However, his position at the education ministry raises eyebrows and in the week that I visit, de Souza is batting off newspaper allegations that she was “tipped-off” about the date of Ofsted inspections (see page 4). The investigation caused people to titter about her successes. Was it all down to back-scratching? But de Souza’s current mingling with millionaires betrays her humble beginnings. Born in Scunthorpe in 1968, she was the middle child among three brothers. Her father was a steelworker, her mother an Austro-Hungarian refugee who looked after the four children. Inspired by an ex-Jesuit teacher, who led her A-level philosophy class, she began reading classic texts – even teaching herself Greek so that she could read Aristotle’s original prose. Aged 18 and clutching the book of her new philosopher-crush, Simone de Beauvoir, she boarded a train at Doncaster and headed to Heythrop College, a small Catholic college affiliated to the University of London, where she would study theology and philosophy. Watching de Souza’s face as she talks about Heythrop, it is clear the experience was transformative. Animated throughout our conversation, it is as if her whole soul is aflame as she describes the joy of digging out dusty books in the caverns of the college’s library. As ever with life though, those times could not last forever. It was 1989 and after graduation “everyone was going off to be an accountant”. De Souza tried it. She lasted five days. After a year working in museums and office receptions, she completed a PGCE at King’s College London before moving with her husband to Oxford. They met on her first day at Heythrop and married so that she could move with him to complete his studies at Jesus College. She taught in a “typical Oxfordshire, slightly under-performing, slightly coasting” school, and quickly became head of the religious education department, introducing GCSE and A-levels in the subject, as well as philosophy. After Tower Hamlets she took a short break to look after her young son, Joe, before returning part-time as a sixth form religious studies teacher. Initially facing low take-up numbers, the department grew to more than 200 students. Still only in her early thirties, she became deputy head at Denbigh High School in Luton. But when a nearby failing school was selected to become one of the first “turnaround academies” under a plan by the then-Labour government, de Souza’s ears pricked up. She knew it was a tough school with low results. She knew they would struggle to find a headteacher. She knew, however, that she would be perfect for the job. At 36 and having worked as a deputy for a short time only, she was not the obvious candidate – but after hours of interview preparation, she got the job. The school’s challenges were enormous. Twenty-five teacher vacancies, endemic low aspirations among students. But she set to work. Yes, she ordered new uniforms. Yes, she sent staff to get students out of bed. To get around the lack of permanent maths teachers in the school, she hired an Australian teacher to teach all students doing the higher paper, for two hours each night, in the school hall using a stereo mic. It was tough work, but it made a difference. In her second year of headship, 100 per cent of students achieved five A*-Cs at GCSE. It became the stuff of legend. From Luton she moved to be principal at an academy in Norfolk, run by Ormiston Academies Trust. After successfully turning around this second school she decided to set up a Norfolk-based academy trust. “I started to think: is a national chain the right thing for here? The right thing for Norfolk? Resources for academies were gone, it wasn’t like the early days when money was just no object.” From this thought, Inspiration was born. Though she clearly loves her work, it comes at a price. “When I was first a headteacher, I think definitely my family suffered, because I hadn’t learnt the art of going home and switching off. So I think I was present but not voting for a good few years.” She professes to being much better at this now – clearly separating home-time from work-time. More recently she faced the problem of becoming a face known to the media: “You can quite naively go around just being you, and then you suddenly realise that actually you’re relatively well-known”. The Ofsted investigation brought this into sharp relief; it concluded as we went to press, ruling that she did not know the date of their visits – so vindicating her hard work. Always self-deprecating during the interview, at one point she refers to the way some people see her as “that evil woman”. Does she really believe they think that? And if you’re left in any doubt that she means what she says, there’s a road in Norwich she’ll happily drive you the wrong way down to prove it.